We are a physician owned and operated urgent care center with state-of-the-art medical equipment, and a physician on-site at all times. 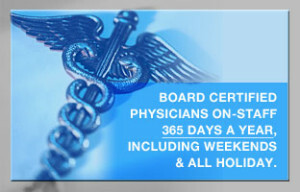 Dr. Musoff is a board certified NY trained physician in multi-specialties. His training and experience has helped to make him the confident and efficient physician he is today. His leadership skills are unmatched. He has held teaching positions at training institutions in New York and currently in Florida. He has mentored and trained medical students, interns, residents, and fellows. ExpressDocs is ready when you need us. No appointments necessary. When was the last time you made an appointment to get sick? Our goal is to ensure you receive the best care in a time-efficient manner. We offer you a calming experience in your time of need. We strive to make your experience unlike any you may have had in the past. You will be welcomed by a pleasant and inviting staff where you will receive quality medical care by a board certified physician. All the while respecting your privacy. Our doors will always be open to you and your family. It will be our honor to care for you.